Spaceboy 3 piece cookie cutter set - spacekids - space toys, dressing up costumes, kids spacesuits, astronaut food, cool space stuff! 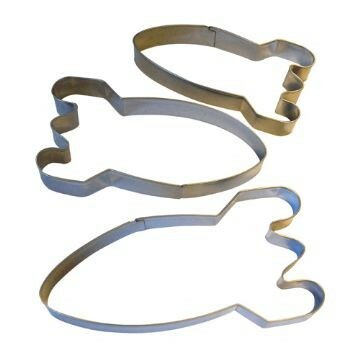 Bake out of this world cookies with this set of 3 stainless steel spaceboy rocketship shaped cookie cutters in box. Sizes Largest to smallest: 13 x 7cm, 12 x 6cm, 10 x 5cm. Hand wash only. Not suitable for use as a toy.